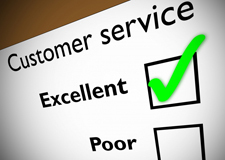 A New Attitude From Your Cleaning Company: Superior Customer Service! One of the unique reasons our business has grown so much larger than other commercial cleaning services in the area is our SUPERIOR approach to customer service. Whether you are having us clean one room or an entire complex of buildings we have the support staff to make sure you know what is going on every step of the way. We make sure throughout the process that everything is being done to your expectations and beyond with random client site visits and inspections, inspection reports, ongoing employee training and improvement programs, complete customized maintenance schedules and checklists. If changes are needed, they are performed quickly, efficiently, and without hassle. In fact, if there are ever any mistakes that are made we bet we will find them and fix them before you even know about it! Our attitude of "whatever it takes to make the client happy" has earned us numerous accolades in the North Florida and South Georgia region. We have been recognized on a regular basis for both excellent quality of service and excellent dedication to customer service. If the company you are considering for your cleaning needs can't offer you this type of SUPERIOR service that you deserve, call Associated Services.